At 5.46AM on January 17, 1995 the early morning bullet train was preparing to depart from Shin-Osaka station bound westwards, first stop Shin-Kobe. 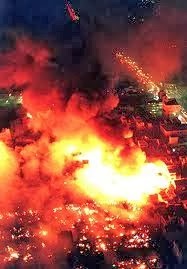 For the next twenty seconds there was a massive earthquake and the city of Kobe ceased to exist in a recognisable form. The driver was physically sick afterwards when he realised what might have happened had it come just a few minutes later. The city had taken a direct hit from an earthquake that had reflected off the mountains and, like waves crossing on the sea, had magnified in intensity to the level that ten story buildings were now lying in the streets. The highway collapsed and the famous picture of a coach hanging over the edge would become part of out collective memories. The port subsided back into the water and Nada-ku began to burn. In the next few hours, ironically only the Yakuza raised any form of relief effort and were handing out blankets and hot meals down by the port to anyone who needed them. The government didn't respond until later in the day when they sent Self Defence Forces on "training flights" over the city to assess the damage. The Self Defence Force were the only organisation with the resources and heavy equipment that day to have made a difference. People were still trapped under the debris and the fires were spreading. In 1995 though, the law still required the Prefectural Governor to sign an authorisation for the SDF to enter the city but the Governor, an ex-communist, refused to allow them entry on constitutional grounds. Eventually, seeing the smoke rising across the city, his Private Secretary signed the order and showed it to the waiting press, announcing the rescue could began as soon possible. He then walked into the Governor's office, showed him the unofficially signed document and said "you go tell them". He remains an unsung hero of the Kobe disaster.